Mytilus is a cosmopolitan genus of medium to large-sized edible, mainly saltwater mussels, marine bivalve molluscs in the family Mytilidae. 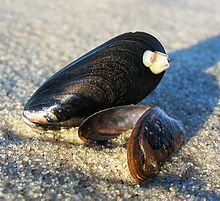 Mytilus mussels are widely exploited as food and used in marine-culture. For instance, in California, they have been consumed by coastal Native American people for almost 12 000 years. J. H McDonald, R. Seed and R.K. Koehn (1991) Allozymes and morphometric characters of three species of Mytilus in the Northern and Southern Hemispheres. Marine Biology 111: 323-333. ^ Erlandson, Jon M., T.C. Rick, T.J. Braje, A. Steinberg, & R.L.Vellanoweth. 2008. Human Impacts on Ancient Shellfish: A 10,000 Year Record from San Miguel Island, California. Journal of Archaeological Science 35:2144-2152. This Mytilidae-related article is a stub. You can help Wikipedia by expanding it. This page was last edited on 5 January 2019, at 13:07 (UTC).